Do you love the work you do, until it comes to having to speak and present in public? Whether your project, idea, proposal, purchase or even budget will be approved or not will be based on your ability to present with confidence and authority. The truth is, many people fear making presentations. 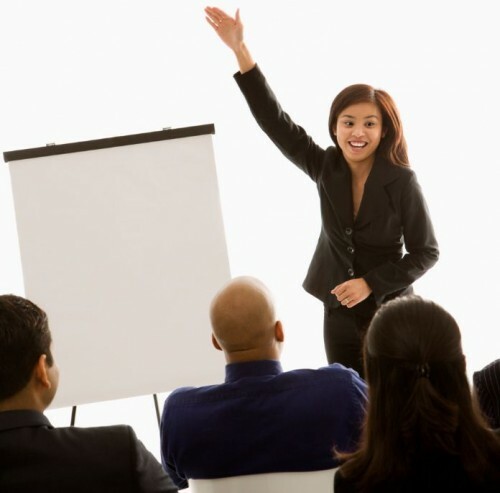 Having conducted a variety of in-house and public presentation skills courses over the years, I find that most participants have the same reasons for attending such courses. Learning new techniques, structuring content or where to stand and what to do with their hands are not the top priorities for the participants. What is more important for them is overcoming their fears and nervousness, and dealing with difficult questions. They want to learn how to build their confidence in front of an audience. This is the key to making a good presentation. When you know the details well, your anxiety level decreases and your confidence level will increase. I believe that people do not bother to learn their material by heart because they think that all they have to do is read off the presentation deck. This not only makes for a disengaging presentation, but you may get thrown off when the boss asks for you to end the presentation prematurely as you will be unsure which information to cut and what to share. Know the content well and remember the important points you wish to convey. No one likes to freeze in front of management and peers like a deer caught in the headlights. One of the best ways to prepare for the dreaded Q&A session is to actually think of potential questions in advance. Make a list of at least five to eight challenging questions and craft the appropriate responses. Practise the responses so they will flow effortlessly when you answer. The goal is to avoid stammering or stuttering. In addition to the difficult questions, you should also prepare responses to some easy questions. • Repeat or rephrase the question. This gives you the opportunity to ensure you have heard the question correctly and that you understand it fully. Maintain eye contact and pause before you respond. If you receive a hostile question, it helps to rephrase it before responding. Once you have crafted your presentation, created your supporting documents or presentation slides, and listed your responses to potentially difficult questions, practise. For individuals looking to improve their presentation skills, practice is essential. In most of the courses I have conducted, most people admit to only practising their presentations twice, at the most. First, practise to hear what you sound like. In fact, you should record yourself. Are there any words you tend to trip over? Are you speaking clearly and finishing every word? What is your pace and tone of voice? Now, go through it again and take note of how long the presentation takes you. If you are given 30 minutes to present, aim to end in 25 minutes. Next, practise the presentation in front of a mirror to see if you make odd facial or hand gestures. Your hands are your visual aids; use them when you want to emphasise particular points. Lastly, keep in mind that every person has the potential to become a calm and confident presenter. Your nerves and fears may not fully subside, but they can be significantly reduced if you follow the tips above. Article by Pamela Wigglesworth, a Singapore-based American corporate trainer and global speaker. She is also managing director of Experiential Hands-on Learning, a training and development company. A resident of Asia for over 23 years, she works with companies across multiple industries to enhance their branding, marketing communications and personal communications skills.